Yup, this is late. Way late. Enjoy! Well, the answer this month is probably clouds, if you live in the same general area as I do. The Pacific Northwest has been pretty well socked in. My other best guess this time of year is Jupiter, bright in the Southwest just about to set. (If you’re wondering about the heading for this section read this). Jupiter will be highly visible in the early evening in the Southwest, setting a few hours after sunset. If you pull out some binoculars and steady yourself against something, you should be able to pick out the moons of Jupiter, just like Galileo did 400 years ago. Mars is rising about 10pm or a little earlier in between Leo and Cancer, and Saturn rises around midnight in Virgo. Venus and Mercury are not visible, they rise and set with the Sun. November 17 – The Leonids meteor shower. It happened already, and wasn’t too spectacular, but the predictions I was reading were saying that there was a small chance of a short outburst. November 18 – Unveiling of new NASA Images at Pacific Science Center. If you missed the unveiling, don’t worry, you can still come and oogle the images – they’re on the wall by the Willard Smith Planetarium. Last half of November – Space Shuttle Atlantis has an 11-day mission to the International Space Station. Only five more shuttle missions left. :( Keep your eyes peeled for Marian Call’s new song “Good Morning Moon” about waking up onboard the ISS. I heard it last night and it is awesome. November 26 – Pacific Science Center closed. November 27 – Planetarium shows at Pacific Science Center are on a weekend schedule. On Mars – Spirit is moving! Keep an eye on it, the drivers are being very careful because they can’t call AAA from Mars, it’s too far to send a tow truck. December 9 – WISE is aiming to launch. This new telescope will be watching the sky in infrared. Last half of December – Don’t miss The Star of Bethlehem planetarium show. You can get tickets at our ticketbooths or online (this show might not be quite programmed into the ticketing and scheduling computers yet, so if it isn’t check back next week or e-mail me after December 1: alice_enevoldsen (a) pacsci.org). SCIENCE: Don’t miss M42 – The Orion Nebula. When looking at the constellation, it’s where Orion’s sword is hanging from his belt. It’s a star-forming nebula made of gas and dust. MYTH:The Bororo Indians of Brazil see a fearsome caiman in the stars of Orion. The Black Caiman of the Amazon is one of the largest types of alligators, and one of the few that poses a danger to humans. Sadly for the Black Caiman, we pose more of a danger to it: it has become an endangered species due to human hunting of its skin. SCIENCE: We’ve got two open clusters in Taurus – The Pleiades (in his shoulder) and the Hyades (the “V” shaped head of the bull. Open clusters are a small collection of stars that are actually gravitationally bound to each other. They tend to be young, newly-formed stars that are slowly moving apart from each other. I love to mention that the Pleiades are my favorite deep sky object in the night sky – because they look different every night. Depending on the weather and your eyes, you might see a smudge, 4 stars, 6 stars, or even 10. With binoculars you’ll see dozens of stars. With a telescope you’ll see hundreds. It’s a great gateway into astronomy. MYTH: Taurus is Zeus – in the bull form he used to conquer Europa. A slightly more family-friendly version of the story has Orion fighting Taurus the bull – and the Pleiades are a wound where Orion has stabbed him. SCIENCE: Castor and Pollux are the “head” stars of the twins. Castor is a septuplet star – three pairs of stars orbiting a common center of gravity. Yii! Six! MYTH: India also considers these stars twins, they are called Aswins, the twin horseman associated with the dawn. SCIENCE: I find Pisces by starting with the circle at the top. It doubles as Pegasus’s wings, although it is officially part of Pisces. MYTH: The only way I can make heads or tails of this constellation is to see it as two fish on an upside-down fishing line. SCIENCE: As it is far out of the plane of the Milky Way, it is easier to see other galaxies in this area of the sky with a good telescope, though none of them are naked-eye visible. MYTH: Cetus is part of the giant Andromeda/Cassie/Perseus/Cepheus/Pegasus mythology. SCIENCE: There are a few clusters and nebulae in Aquarius, but the one that I find most beautiful is the Helix nebula. It’s a planetary nebula – an exploded envelope of gas around a dying Sun-like star many, many years ago. Do not confuse it with the Ring Nebula – it looks similar, and is the same type of nebula. MYTH: Aquarius is the Water-bearer. This is also the constellation referred to in the phrase “Age of Aquarius” – but that’s of astrological significance, which I can’t speak to. SCIENCE: Epsilon Eridani (ε Eri, a star in Eridanus) is a Sun-like star, AND we’ve detected two debris belts (like our Asteroid Belt and Kuiper Belt) around it. Beyond that there are at least two planets there. TRIVIA: ε Eri is a very popular location in science fiction. In this case, I recommend the Wikipedia article. 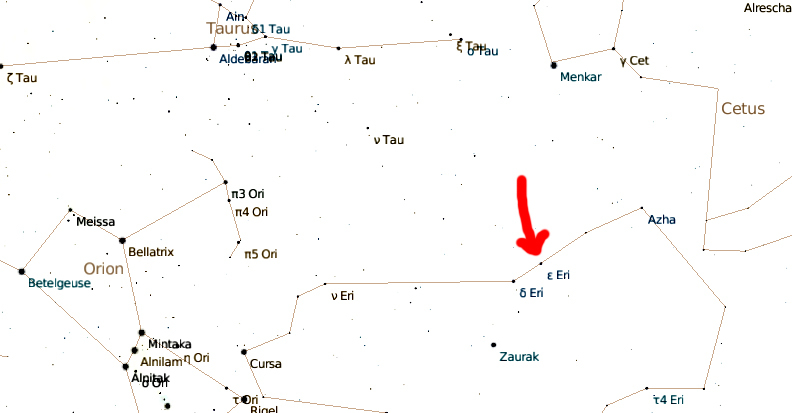 Notably – Babylon 5 is located at ε Eri. I thought I had been told that Vulcan orbited ε Eri, but I can’t find official confirmation of that. Vulcan is supposedly 16 lightyears away – ε Eri is 10 lightyears away. For a good beginner’s guide to the sky, try StarDate, Sky and Telescope’s Stargazing Basics, or Sky and Telescope’s links to lots of beginning topics. Happy sky viewing, and if you can’t get your fix because of clouds, play with some of the online telescopes.